The Shimonoseki Campaign (Japanese:下関戦争/ 馬関戦争, Shimonoseki Sensō/ Bakan Sensō) refers to a series of military engagements in 1863 and 1864, fought to control Shimonoseki Straits of Japan by joint naval forces from Great Britain, France, the Netherlands and the United States, against the Japanese feudal domain of Chōshū, which took place off and on the coast of Shimonoseki, Japan. The Japanese term for this event translates to the Shimonoseki War. Despite efforts of appeasement by the Tokugawa shogunate to establish an atmosphere of peaceful solidarity, many feudal daimyos remained bitterly resentful of the shogunate's open-door policy to foreign trade. Belligerent opposition to European and American influence erupted into open conflict when the Emperor Kōmei, breaking with centuries of imperial tradition, began to take an active role in matters of state and issued on March 11 and April 11, 1863 his "Order to expel barbarians" (攘夷実行の勅命 – Jōi jikkō no chokumei). The Chōshū clan, under Lord Mori Takachika, began to take actions to expel all foreigners after the deadline of the 10th day of the 5th month, by the Lunar calendar. Openly defying the shogunate, Takachika ordered his forces to fire, without warning, on all foreign ships traversing Shimonoseki Strait. This strategic but treacherous 112-meter waterway separates the islands of Honshū and Kyūshū and provides a passage connecting the Inland Sea with the Sea of Japan. Even before tensions escalated in Shimonoseki Strait, foreign diplomats and military experts, notably U.S. Foreign Minister to Japan Robert Pruyn and Captain David McDougal of the U.S. Navy, were aware of the precarious state of affairs in Japan. A letter to the Secretary of the Navy, Gideon Welles, dated June 12, 1863 written by McDougal stated, "General opinion is that the government of Japan is on the eve of revolution, the principal object of which is the expulsion of foreigners.". "Sonnō Jōi": "Revere the Emperor and expel the barbarians!". The Chōshū clan was equipped with mostly antiquated cannons firing cannonballs, but also some modern armament, such as five 8-inch (200 mm) Dahlgren guns, which had been presented to Japan by the United States, and three steam warships of American construction; the bark, Daniel Webster of six guns, the brig Lanrick, or Kosei, with ten guns and the steamer Lancefield, or Koshin, of four guns. The first attack occurred on June 25, 1863, soon after the Imperial "Order to expel barbarians" came into effect. The U.S. merchant steamer SS Pembroke, under Captain Simon Cooper, was riding anchor unsuspectingly outside Shimonoseki Strait when intercepted and fired upon by two European-built warships belonging to the rebel forces. The crew of one enemy vessel taunted the frantic American seamen with a loud and unnerving cry, "Revere the Emperor and expel the barbarians!" ("尊皇攘夷", pronounced "Sonnō Jōi"). Under incessant cannon fire, Pembroke managed to get underway, and escaped through the adjacent Bungo Strait, miraculously with only slight damage and no casualties. Attack on the French warship Kienchang. Upon arrival in Shanghai, Cooper filed a report of the attack and dispatched it to the U.S. Consulate in Yokohama, Japan. Next day, June 26, the French naval dispatch steamer Kienchang was also riding anchor outside the strait, when rebel Japanese artillery atop the bluffs surrounding Shimonoseki opened fire on her. Damaged in several places, the French vessel was lucky to get away with but one wounded sailor. On July 11, despite warnings from the crew of the Kienchang, whom they had rendezvoused with earlier, the 16-gun Dutch warship Medusa cruised into Shimonoseki Strait. Her skipper, Captain François de Casembroot, was convinced that Lord Mori would not dare fire on his vessel, due to the strength of his ship and longstanding relations between the Netherlands and Japan. But Takachika did just that, pounding Medusa with more than thirty shells and killing or wounding nine seamen. De Casembroot returned fire and ran the rebel gauntlet at full speed, fearful of endangering the life of the Dutch Consul General, who was on board Medusa at that time. Within a short time, the Japanese warlord had managed to fire on the flags of most of the nations with consulates in Japan. The USS Wyoming battling in the Shimonoseki Straits against the Choshu steam warships Daniel Webster, Lanrick and Lancefield. In the morning of July 16, 1863, under sanction by Minister Pruyn, in an apparent swift response to the attack on the Pembroke, the U.S. frigate, USS Wyoming, under Captain McDougal himself sailed into the strait and single-handedly engaged the US-built but poorly manned local fleet. For almost two hours before withdrawing, McDougal sank two enemy vessels and severely damaged another one, along with inflicting some forty Japanese casualties, while the Wyoming suffered extensive damage with fourteen crew dead or wounded. The two Japanese steamers sunk by the Wyoming were raised again by Chōshū in 1864 and attached to the harbor of Hagi. The French engagement at Shimonoseki, with the warships the Tancrède and the Dupleix, under Captain Benjamin Jaurès. "Le Monde Illustré", October 10th, 1863. On the heels of McDougal's engagement, on July 20, the French Navy retaliated for the attack on their merchant ship. The French force consisted of marines and two warships, the Tancrède and the Dupleix. With 250 men, under Captain Benjamin Jaurès, they swept into Shimonoseki and destroyed a small town, together with at least one artillery emplacement. The intervention was supported by the French plenipotentiary in Japan, Duchesne de Bellecourt, but the French government, once informed, strongly criticized their representatives in Japan for taking such bellicose steps, for the reason that France had much more important military commitments to honour in other parts of the world, and could not afford a conflict in Japan. Duchesne de Bellecourt would be relieved from his position in 1864. Meanwhile, the Americans, French, British and Dutch feverishly opened diplomatic channels in an effort to negotiate the reopening of the passage to the Inland Sea. Months dragged by with no end in sight to the growing dilemma. By May 1864, various bellicose Japanese factions had destroyed thousands of dollars in foreign property, including homes, churches and shipping. This wanton destruction included the U.S. Legation in Tokyo, which housed Minister Robert Pruyn. Throughout the first half of 1864, as Shimonoseki Strait remained closed to foreign shipping, threats and rumors of war hung in the air, while diplomatic efforts remained deadlocked. Then the British Minister to Japan, Sir Rutherford Alcock, discussed with his treaty counterparts such as American Minister Robert Pruyn, the feasibility of a joint military strike against Takachika. They were soon making preparations for a combined show of force. Under the wary eyes of the Japanese, fifteen British warships rode anchor alongside four Dutch vessels, while a British regiment from Hong Kong augmented their display of military might. The French maintained a minimal naval presence, with the bulk of their forces in Mexico trying to bolster Emperor Maximilian's unstable regime. The U.S., engaged in civil war, limited itself to demonstrate diplomatic and minimal military support for the Allies. In the meantime, Takachika procrastinated in negotiations by requesting additional time to respond to the allied demands, a course of action unacceptable to the treaty powers. The allies decided that the time for united action had arrived. Despite retaliatory action from the treaty powers, another attack occurred in July, 1864, when the rebel forces fired upon the U.S. steamer Monitor after she entered a harbor for coal and water. This provoked further outrage, even after a British squadron was returning to Yokohama after delivering a multi-national ultimatum to Takachika, threatening military force if the strait was not opened. The bombardment of Shimonoseki by the French warship Tancrède, Jean Baptiste Henri Durand-Brager, 1865. The British naval brigade and marines storm the stockade at Shimonoseki, Illustrated London News, December 1864. On August 17, 1864, a squadron consisting of nine British (Euryalus, Conqueror, Tartar, Leopard, Barrosa, Perseus, Argus, Coquette, and Bouncer), four Dutch (Amsterdam, Medusa, Metalen-Kruis, and D'Jambi), and three French warships (Tancrède, Sémiramis, and Dupleix), together with 2,000 soldiers, marines and sailors, all under the command of Admiral Sir Augustus Leopold Kuper of the Royal Navy, steamed out of Yokohama to open Shimonoseki Strait. The U.S. chartered steamer Takiang accompanied the operation in a token show of support. The two-day battle that followed on September 5 and 6 did what the previous operations could not; it destroyed the Prince of Nagato's ability to wage war. 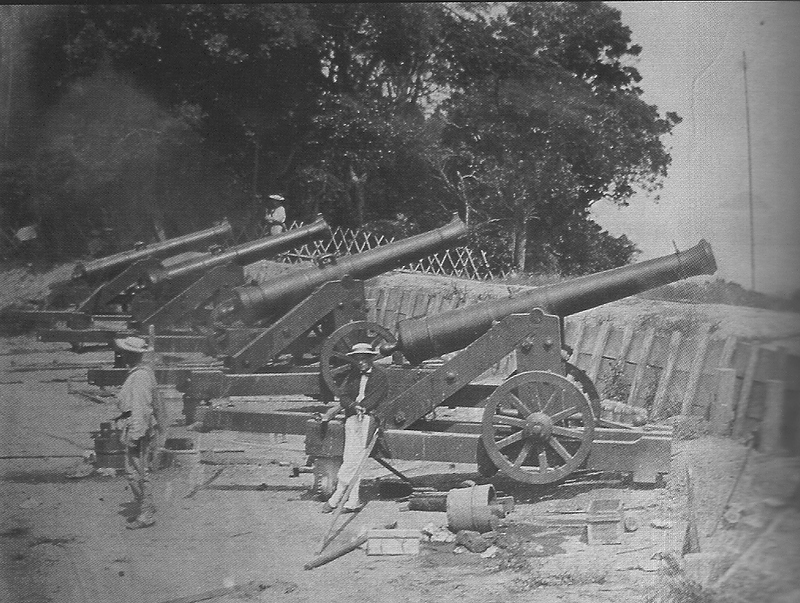 Unable to match the firepower of the international fleet, and amid mounting casualties, the rebel Chōshū forces finally surrendered two days later on September 8, 1864. Allied casualties included seventy-two killed or wounded and two severely damaged British ships. A full account of the battle is contained in Sir Ernest Satow's A Diplomat in Japan. Satow was present as a young interpreter for the British admiral, Sir Augustus Kuper on the British flagship HMS Euryalus commanded by Captain J.H.I. Alexander. It was also the action at which Duncan Gordon Boyes won his Victoria Cross at the age of seventeen. Satow described Boyes as receiving the award "for conduct very plucky in one so young." Another VC winner at Shimonoseki was Thomas Pride, and the third was the first American to win the medal, William Seeley. De Casembroot wrote his account of the events in De Medusa in de wateren van Japan, in 1863 en 1864. The stringent accord drawn up in the wake of the ceasefire, and negotiated by U.S. Minister Pruyn, included an indemnity of $3,000,000 from the Japanese, an amount equivalent to the purchase of about 30 steamships at that time. The Bakufu proved unable to pay such an amount, and this failure became the basis of further foreign pressure to have the Treaties ratified by the Emperor, the harbor of Hyōgo opened to foreign trade, and the customs tariffs lowered uniformly to 5%. In 1883, twenty years after the first battle to reopen the strait, the United States quietly returned $750,000 to Japan, which represented its share of the reparation payment extracted under the rain of multi-national shells. Several life-size replicas of the guns used by Chōshū can now to be found at Shimonoseki in the spot where they were captured. They were put there by the Shimonoseki city government in 2004, in recognition of the importance of the bombardment in Japanese history. The replicas are made of hollow steel and include coin-operated sound effects and smoke from the barrels. Chōshū forces attacking Shogunal forces in Kyōto on August 20, 1864, in the Kinmon Incident. Right after the foreign interventions, the Shogunal government also launched its own preparations for a punitive expedition against Chōshū, the First Chōshū expedition. The expedition was aimed at punishing the 1864 Kinmon Incident in which Chōshū forces attacked Shogunal forces in Kyōto. The expedition was however cancelled after a compromise was brokered, involving the beheading of the leaders of the rebellion. Closely resembling the series of little conflicts fought by the European powers in Asia, Africa and elsewhere during the Nineteenth Century, the troubles in Japan seemed to exemplify their gunboat diplomacy, a prevalent tool in imperialism. Bitter resentment against foreign influence made the Chōshū clan feel justified in engaging in foolish acts of military provocation, in defiance of their own government. The same nationalistic anger directed against foreigners demonstrated by the Japanese would flare up again in the Chinese Boxer Rebellion. The U.S. and its European allies then felt compelled to use military force to uphold the treaty with Japan. For the U.S., July 1863 was a momentous month for Northern arms at the battles of Gettysburg and Vicksburg. While it was bitterly embroiled in the American Civil War, the world was carefully watching President Abraham Lincoln's government for signs of weakness and indecision. The actions of USS Wyoming made it the first foreign warship to offensively uphold treaty rights with Japan; this fact coupled with the possibility that the events would mire the U.S. in a foreign war made the battle of Shimonoseki a significant engagement. While the battles of Shimonoseki Strait were mere footnotes in the histories of the European powers, an interesting aspect of the affair was the resourcefulness displayed by the Japanese, something another generation of Europeans and Americans, eighty years later would come to appreciate. The feudal Japanese did not set eyes on a steam-powered ship until Commodore Perry's arrival only a decade before USS Wyoming's battle. Yet they had rapidly learned the ways of the Europeans within that brief span, purchasing foreign vessels and arming them with foreign weaponry. The quality and abundance of these armaments in 1860s Japan shocked the world.